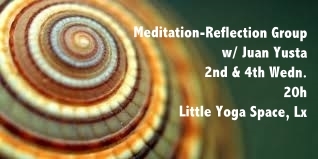 Meditation practice and sharing of experiences, doubts and objectives in our practice of Meditation, Yoga, etc. The idea is not to present knowledge in a class format, but rather to propose topics that are relevant to the subject at hand and establish a conversation about the difficulties and doubts that arise when considering spiritual realization and other spiritual aspirations as true possibilities in our contemporary lives. Juan Yusta, as a conscious committed aspirant to spiritual realization and an already experienced traveller of the eternal path, will contribute with its experience and insights, acquired through decades of dedicated work to this endeavour." I.P.